Thanks to our friends at Hackney Marsh Users Group (http://www.london21.org/page/85/show/10032) we have got some beautiful tree stumps for Leabank Square. We have put them in the middle of the square for everyone to use to sit, have a cuppa & a ponder. But please feel free to suggest any alternative uses for them. If anyone is a sculptor in the square - maybe we can have some art dotted all around, if anyone knows where to get one of those huge wooden cable rollers - maybe we can make a picnic area, Lisa suggested we leave them where they are & have some jam sessions in the middle of the square! Anyhow - please all go for a sit down & soak up the great atmosphere of Leabank Square - and then come & tell us all about it in the comment section! Check this amazing team of painters out!!! I know that some of them arrived back home covered in paint (sorry!!) - but you have to agree that it is worth it. Our brand new sign looks magnificent! Every rambler, jogger, walker, canoeist, Olympic worker, boat captain, police person, rower & cyclist going past Leabank Square on the canalside - will now be amazed at our beautiful new sign! Thanks crew - you're the best!!! Is this not just the cutest gardener in Leabank Square?! In just a few short weeks - there will be delicious strawberries cascading from the southside spiral staircase of the centre block!! Please feel free to help yourself whenever you see them. Oh....... and watch out for the scrumptious tomatoes coming all along the canal soon! These are just some of the amazing Leabankers who turned out to green the spiral staircase of the middle block!! A massive thanks have to go to Lisa for keeping everybody supplied with delicious sarnies, refreshing juices, soothing sounds and LOADS of encouragement!! Lisa - we all would have given up half way thru if it wasn't for you - Thanks!! Another brilliant idea from yet another Leabank Square child - was to start re-cycling plastic milk bottles. And what better way to do it than planting colourful flowers & strawberries?! ....... it's coming to a fire exit near you!!! As we all know - gardening is heaps of fun - but can be very expensive. One of the children in Leabank Square came up with a brilliant idea for potting our canalside plants - re-cycle a handbag that had been thrown into the wheelie bin. It worked so well that we took a trip to a few charity shops & got loads more for much cheaper than we would've had to fork out for new pots - and looks far more interesting than boring pots anyway!! You are invited to attend the AGM and constitution of the first Hackney Wick Festival, taking place in September 2008. We would be delighted if you could attend and look forward to seeing you. These organisations between them provide a vital range of community based activities from recreation through to heritage, employment and creativity. They are also, importantly, strategically placed at the gateway to a planned Olympic village and close to the Press and Media Centre which form an important part of the Olympic legacy. The Cultural Olympiad launches W/E 26 – 28 September 2008. This provides the perfect opportunity for us to raise the profile of the Hackney Wick Festival. to understand better what the area can and does provide and to be able to access the facilities available within this key area. Local centres and organisations will also have the opportunity to organise their own venue based events to showcase / promote themselves – e.g. an open day, sports event, athletics/martial arts display, taster session, art exhibition, open studios, performance, garden and talent competitions, raffles. Sunday 28th September - the primary focal point for these events will be the Village Green opposite St. Mary of Eton on Eastway where the one day Hackney Wick Festival Fete will be held as the main event of the Festival weekend. Hackney Wick Festival Saturday 27 Sept – Local centres and organisations open up for the day and organise their own venue based events to showcase / promote themselves – e.g. an open day, sports event, athletics/martial arts display, taster session, art exhibition, open studios, performance, garden and talent competitions, raffles. Hackney Wick Festival Fete Sunday 28 Sept – one day outdoor Festival main event on the Village Green, Eastway. Stalls, food, community and family activities. Public Works artist activities. SPACE artists’ commission – the group of artists known as Public Works will carry out a pre-programme of research and community engagement that will inspire and bring together the local communities. Ultimately this programme will result in the Hackney Wick Festival Fete on Sunday 28 September. This innovative research process through which information can be disseminated as well as public opinion and ideas expressed, could include events ranging from walks for older people, food sharing events/picnics, creative mapping workshops, a one day café in the church precinct, information sharing, all within a framework designed by the artists. London Open House – London-wide architecture event. St Mary of Eton will open its doors for visitors and explorers curious to see round this historic building. Audio guided tour – pick up a CD player from any of the Festival venues - plug in and be guided around Eastway by the children and people who live here. Adaptive Actions – Jean Francois Prost, SPACE artist in residence; project looking at the Blue Wall around the Olympic site in Hackney Wick. John Frankland, artist, new public art work – 100 tonne granite boulder, transported up from Cornwall and lowered into place on Mabley Green in June. A twin boulder will be placed in Shoreditch Park at the same time.Peer Gallery and Core Arts. Climbing activities? Artist’s Talk? Art of Common Place –Talkeoke, devised by Michael Weinkove, is a performance/debating platform that generates discussion at social events in an engaging, fun way. It will be an outdoor event at the Hackney Wick Festival Fete and will engage a diverse audience to participate in lively discussions and opinion sharing. Part of a series of dialogues looking at the use of open, common spaces, by Gunpowder Park in partnership with SPACE. Blue Fence Project – writer in residence project at Gainsborough Primary School, with Immediate Theatre and Sanctuary Housing. Hackney Wick Digital Map – London21 with artist Christian Nold. Community Garden – Trowbridge Day Care Centre. Bike Project – Youth4Hackney Recycling, training, maintenance. You cannot but have noticed the massive tower block going up in nearby Felstead Road!! It just seems to be getting higher & higher!! 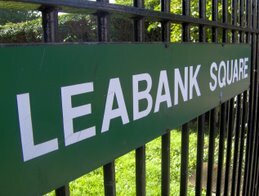 For those Leabank Square residents with a longer history - you may recall that our local councillors (check out: http://www.hackney.gov.uk/w-wards-list.htm) campaigned long & hard for the space to be turned into a community park - somewhere we could all call the Heart of Hackney Wick. But the powers that be had other ideas - so having recently demolished the infamous Trowbridge Towers - they gave permission for another lot of towers to be built. Aaaaaaaanyway - we have got them now - and there's nothing we can do about it now. BUT!!!! There is something we can do to influence how they fit into out existing community. Just as we all welcomed with open arms - the fantastic new Travellers in Wallis Road - we will - of course all welcome the new residents of Hackney Wick to Felstead Road. But it is what is happening at ground level that we can have even MORE influence on. Take a closer look at the picture above. 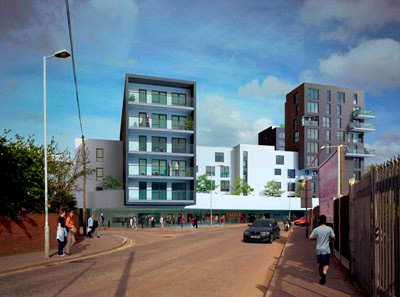 This is the view of the new development from the Eastway looking down Chapman Road. Check out the street level. There are going to be several premises licensed for commercial use all around the base of this new development!! This is where we all come in to the equation. We have been asking about 150 shoppers to the neighbouring Watermelon Shop (that's the Premier Newsagents to you & me - it's just that most of the local kids call it the Watermelon Shop 'cos they have crates of delicious Watermelons outside in Summer!) what they would love to see open up all down the road? But the most surprising thing that was said was that many of the locals interviewed wanted to open one of these up themselves!!! And that's where we in Leabank Square & Hackney Wick can have the biggest influence on how this huge development interacts with us all. If you know of anyone local who wants to set up - say a pharmacy - tell them to do it here - it would benefit us all - and they will make a bucket load of money!!! Come on Leabank Square - there has got to be a few of us who wants to work locally and do something really great for our community! If we don't start making enquiries at the linked web site (click on 'Tower Block' at the top) - you know that some really rich person from the other side of London is going to come & take all our money! Leabank Gardeners Are a Tough Bunch! Even though it is still quite nippy - some very tough Leabank Square gardeners came out to prepare the garden for summer! Thanks to Cyprus, Sunoor, Safiri & Shanthi for braving the low temperatures & planting 60 packets of seeds, 50 bulbs & 10 shrubs. This is going to make Leabank Square the envy of the whole of Hackney Wick this summer! Sunoor even spent time carefully sighting her Gladioli Bulbs - so that she can see them from her window!